Nathan Kraatz | Wilmington News Journal A storm struck New Vienna Friday, tearing the roof off of this mobile home on Bernard Road. Inside, Tracy Lopez covered her daughter and two boys she was babysitting. “I wasn’t thinking of anything but the safety of the kids,” Lopez said. “I think I’m still in shock.” The storm damaged several areas of New Vienna. New Vienna Police Chief Clint Brown said no one had been reported injured as of approximately 7:30 p.m.
South South Street near Bisig Automotive became more flooded than usual Friday afternoon when a plastic panel from beneath a vehicle floated into a storm drain and clogged it. The News Journal was on scene and removed the clog. A sinkhole claimed a portion of Ireland Road Friday after a torrential downpour. A swollen Lytle Creek flows underneath Nelson Avenue during a rain shower Friday afternoon. NEW VIENNA — Homes were seriously damaged and tree limbs and power lines downed Friday afternoon and evening when a storm hit New Vienna. The side of one home was torn off by wind, and, on Bernard Road, a babysitter protected her daughter and two boys from the damage when the roof of her home flew into a nearby tree. Tracy Lopez said she “hunkered down” and practically laid on top of the three children to protect them. According to New Vienna Police Chief Clint Brown, no one was reported injured as of approximately 7:30 p.m.
“I thank God that we made it out alive and nobody got hurt,” said Lopez. Driving down Bernard Road, one saw several trees lining, and in the middle of, the road. And, on Leeka Road, the side of Adrianne and Tyler Williams’ home was torn off while they were at work. They had just finished remodeling a hallway and the bedroom of the house built in the 1800s. Their four dogs, Oliver, Isabelle, Czar and Priscilla, were OK.
Drenching downpours, strong localized winds and flash flood watches and warnings were the norm Friday throughout Clinton County and southwest Ohio. Excessive flooding and high winds caused damage during the afternoon, resulting in felled trees and several sinkholes. Also, early Friday evening, police were still on the scene at a house on Bernard Road in New Vienna, which received heavy wind damage. Rainfall totals on Friday stood at about one inch, according to Kristen Cassady with the National Weather Service in Wilmington. 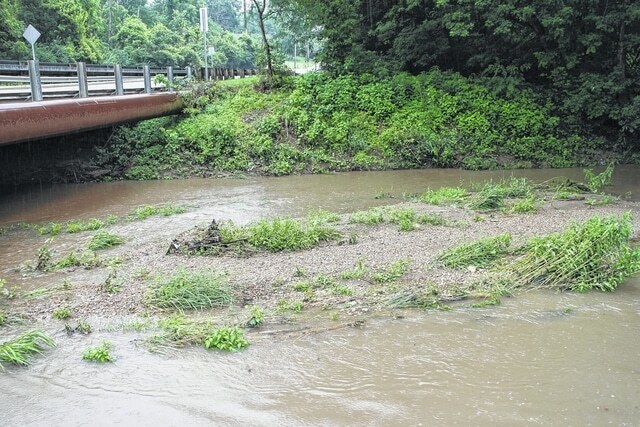 She told the News Journal Clinton County has already had six and a half inches of rain for June, about four of which have been within the past week. Cassady said next week will be fairly wet as well, saying June could very well come to a close with a total of about 10 inches. “It will likely go down as one of the wettest Junes on record,” Cassady said. The threat of rain, which caused organizers last week to postpone Wilmington’s June 19 Party at the Mural, also caused last night’s (June 26) downtown Wilmington event to be cancelled. Wilmington Police Chief Duane Weyand said there were some places where 10 to 12 inches of standing water had accumulated.